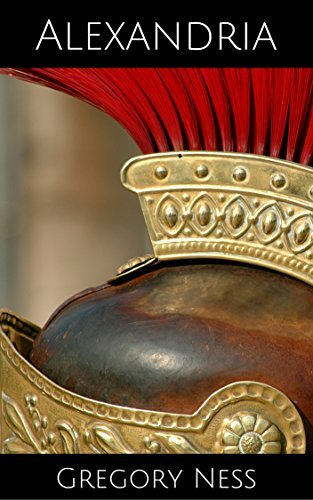 Article first published as Book Review: ‘Alexandria’ by Gregory Ness – Book Two of ‘The Sword of Agrippa’ on Blogcritics. “Alexandria” is the second book in The Sword of Agrippa series by Gregory Ness. In this gripping dystopian sci-fi adventure, readers will come away from the experience reflective upon the possibility of living past lives and how those past lives could potentially impact science, discovery, and the very existence of a future. The story begins in ancient Rome with the discovery of a long-lost temple, by Julius Caesar, Marcus Agrippa, and Cleopatra, along with her sister, Samia. Marcus and Samia are sealed in the temple overnight to study the findings of the magnificent artifacts. While there, the two enter into a spiritual ritual bonding them together for eternity. Then it’s on to Prague, where scientist Roy Swenson has been exiled after his experimental research was shut down in the U.S. Roy is currently conducting dream sequence viewings in hopes of revealing the secrets of dark energy. He must be getting close because opposing forces are going to great lengths to keep this research suppressed. I love how Ness uses a multidimensional storyline to interweave the history of Egypt during the times of Caesar and Cleopatra, with a disturbing portrait of a dystopian society in the not too distant future of 2025, and takes the reader back and forth between the two worlds. This author clearly has “show vs. tell” down to an art form as he maneuvers the reader through the story with meticulous and crisp writing, imprinting distinct pictures in the mind as the narrative unfolds. Drawn to the world of long ago and the timeless stories only history can tell, I found I could not get enough of the ancient Egyptian storyline. Cleverly crafted, Ness paints a portrayal of this time period with authentic expression, vivid imagery, and well-developed characters. History, sci-fi, time travel, romance with a bit of erotica, and lots of action and adventure, “Alexandria” by Gregory Ness, will brilliantly appeal to a wide span of readers. There is truly something for everyone is this fascinating story. An unexpected twist during the research trials adds another layer of possibilities, and the end of book two sets the perfect stage for “Actium,” the next adventure in The Sword of Agrippa series.